This is another continuation on the healthy theme, though at least it is solid food again! I bought some chicken fillets a few days ago and have been so busy with work that I hadn't had time to do anything with them until now. I got home at 8pm after a long day at work, and as the boy had cooked me a delicious Valentine's meal the night before, I felt I should make a little effort. This is exceedingly quick to make, and can be on the table in 30 minutes. Not bad for a quick mid-week supper! Slice the chicken in half horizontally, so you're left with two thin pieces of breast from each fillet. Transfer to a bowl and marinade in the balsamic and olive oil for 15 minutes. While the chicken is marinading, deseed and slice the red pepper into strip, dice the tomato, and peel a garlic clove ready for crushing, then over a low heat slowly fry the peppers and tomato in a little oil until very soft. After about 5 minutes, add the crushed garlic, 1/2 teaspoon of pomegranate molasses and a splash of water (which will reduce to nothing as the peppers cook). Next, diagonally slice the courgette into 5mm ribbons and fry in a fresh pan in about a teaspoon of oil. Thinly slice the remaining 4 cloves of garlic. After 5 minutes, when the courgettes are just starting to soften, add the garlic and fry for a further 5 minutes or until the courgettes are golden. Using a griddle on a high heat, fry the chicken for 2-3 minutes on each side, until cooked through. Meanwhile, wilt the spinach, discarding any excess liquid. Arrange the spinach on two plates, then divide up the courgettes, placing on top of the spinach. Place a couple of chicken fillets on the courgettes and spinach, and then garnish with the red peppers. Finally, drizzle a little olive oil and balsamic vinegar over the chicken. I served this with rice, but it would be equally good with sautéed potatoes. Pomegranate molasses you say? Phwoaarggh. I absolutely love that stuff, and currently have a bottle of it secreted away at the back of my cupboard in case of 'emergencies'. Did you know that it's also really good dolloped over porridge? I absolutely love it too! I didn't know that it was good over porridge - that'll be breakfast tomorrow then - but I did know it was sublime with champagne, vodka and grapefruit juice as part of a cocktail. Slurrrp! I can never decide if everyone should know about it, or whether I want to keep it as "my little secret". This looks fabulous! I had to look up to see what a courgette was.... zucchini to me! Now I need to find me some pomegrante molasses on this side of the world. Great meal! Cheers! This looks so nice! 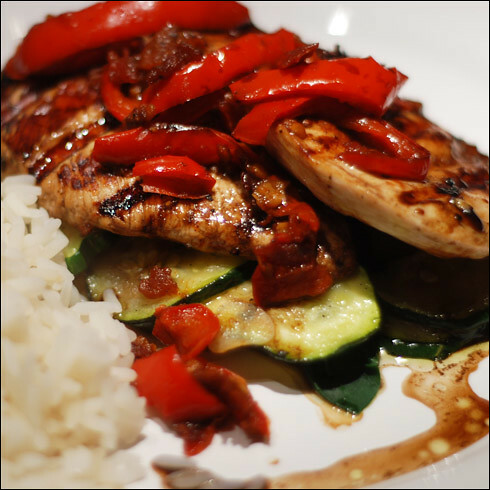 I often cook chicken with wine but I never thought of using balsamic vinegar. I'll give this a go tonight..even though, I might have to skip the pomegranate molasses bit because I don't have it. Robin - if you've got any good eastern shops nesrby you should be able to find pomegranate molasses there. good luck! Silvia - you can get pomegranate molasses in any larger sainsburys branches. have a look in the deli/foodie aisle and it should be there. if you don't have any, just use a little demerera sugar instead. it helps bring out the sweetness of the peppers.